Although we know prophecy exists, it is a very challenging concept to understand because it is hard to define exactly what it is or how it works. Yet, abstract and obscure as it may be, we are not completely in the dark. The Bible is not only the source of our limited knowledge about prophecy, but first and foremost, it is the fruit of prophecy. One thing we know for certain, therefore, is that prophecy is the channel through which the Divine and the Eternal communicates with earthly mortals. We usually associate prophecy with the foretelling of future events. This aspect indeed represents a considerable part of the Biblical prophetic literature, but the revelation of the future is not a goal in and of itself. Unlike the ancient practices of future telling, which the Bible explicitly forbids, the prophets’ vision of the future has an ethical or moral goal as its primary focus. Their prophecies go hand in hand with God’s guidance, (which is actually a very fitting translation for the word “Torah”), and with the demand put before mankind “Lataken olam bemalchut Shaddai,” to mend the world in the Almighty’s Kingdom. The late Professor Yeshayahu Leibowitz once made the following sharp observation about the nature of prophecy: “The prophets did not foresee what will be,” he said “but what ought to be.” This statement does not mean that prophecy was merely some kind of wishful thinking, but rather to emphasize, (using Middle Eastern style rhetorical exaggeration), the primary purpose of prophecy. The prophets set before us a vision of a world in which mankind has a full awareness of God’s calling, in which true justice reigns, and in which there is no more human suffering. This vision of utopia is given not only to be a source of consolation and hope; it is also a blueprint for conducting a life of faith here and now. The liberty granted to the people of Israel on their exodus from slavery requires that we take responsibility for one another. Man’s freedom of choice is the backbone of prophecy and of Jesus’ call for repentance. Prophecy, therefore, is not a profession, but a state of mind. The prophetic mind sees clearly what the will of God is and knows how to put it into words that touch people and motivate them to do the right thing. Don Quixote, the Spanish celebrity posing on this volume’s cover, is an outstanding example of the prophet’s true character: a dreamer whose eyes are constantly lifted up to heaven and who sticks to his ideals no matter what, even though his ideals are profaned by those who mock his “lunacy.” In truth, even his “right hand man” Sancho often pays the lip service of loyalty to his master’s voice, but due to his worldly aspirations and human weaknesses, he fails time and time again to stand up to those ideals. If as some literary critics suggest, Don Quixote is in some way a reflection of the Messiah, then Sancho Panza may well be an amusing image of Simon Peter, who represents each one of us, enthusiastic and compromising. We ridicule the enlightened knight as he charges at the windmills he thinks are demons. In fact, the joke is on us because there really are demons turning the wheels behind the scene, but only he can see them. This was the lot of all of God’s true prophets who were “ahead of their time.” They were despised and rejected, beaten and martyred, only to have their tombstones sanctified by the descendents of their persecutors, who realized, too late, the true value of their message. Like the prophets who preceded him, the Savior, “The Mighty One of Jacob” (Isaiah 49:26), is indeed the ultimate archetype of this knightly “Don Quixotic” adventure. 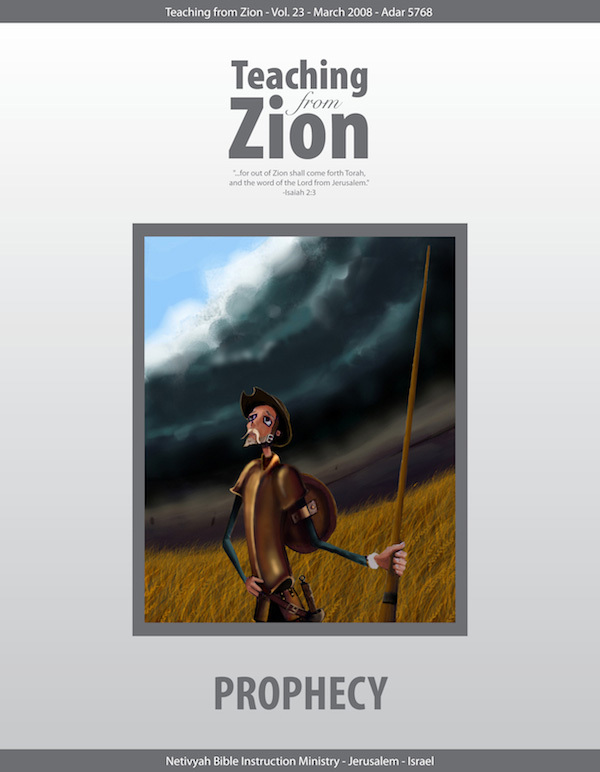 In light of this particular viewpoint, it is our hope that this issue of Teaching From Zion, with its various perspectives on the phenomena of Biblical prophecy, will not only enrich our theoretical knowledge of this important spiritual matter, but also draw us closer to the essence of the prophetic vision itself, which is as fresh and relevant today as it ever was.